The latest edition of The Millennium Project’s annual State of the Future series includes the results of the group’s Delphi survey on the future of work, which focuses particularly on the impacts of technology on the workplace and workforce. Whether these developments will create more jobs than they destroy is debatable, but we are already seeing jobless economic growth as the new norm, as well as increasing concentration of wealth and widening income gaps and long-term structural unemployment as a “business as usual” scenario, the authors write. If current trends remain unchanged, average unemployment will grow to 11 percent by 2020 and to 24 percent by 2050. Robotics is the technology rated most likely to replace more jobs than it creates. Factors most likely to create jobs (or reduce mass unemployment) are new economic and work concepts and increased self-employment, freelancing, and DIY support systems. Retraining programs for more-advanced skills and STEM requirements in all levels of education are the actions thought most likely to be deployed and to be effective for creating new employment or income by 2050. A guaranteed lifetime income will be “absolutely necessary” or “very important” by 2050, according to more than half (59 percent) of the respondents. The next step for the Delphi project, according to Glenn, “will be to write alternative scenarios and roadmaps to 2050.” The 2015-16 State of the Future also provides the latest trends on 28 indicators of progress and regress and updates the 15 Global Challenges. Details: 2015-16 State of the Future by Jerome C. Glenn, Elizabeth Florescu, and The Millennium Project Team (2015, The Millennium Project). Ongoing waves of rapid change have unnerved many, whose “objective, stated and unstated, is to stop perceived changes in status, power and wealth,” Chernow says. But demographic factors, such as increased ethnic and racial diversity and the rise of the powerful millennial generation (and its more secular values), may narrow many of the divides now keenly felt in U.S. society. Reference: Bob Chernow, “Severe polarization in U.S. could end in 5-7 years,” BizTimes.com (July 9, 2015). Barry Hughes, director of the Frederick S. Pardee Center for International Futures, has announced he is “going to cut back a bit.” Taking a sabbatical next year to write a book on world modeling and international futures, he will also lead the search for a new director for the Pardee Center (placement effective by fall 2016). Hughes, who also is the John Evans Professor of international studies at the University of Denver, will retain a “senior mentor” role at the Pardee Center. Jonathan Moyer, the Center’s associate director, will be acting director. Details: Frederick S. Pardee Center for International Futures. They say everyone talks about the future but no one does anything about it. 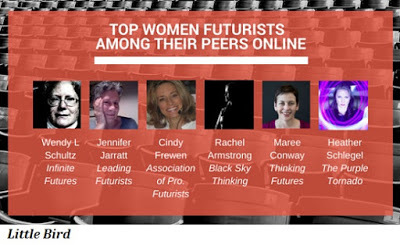 In response to the provocative (or provoking) question “Why Aren’t There More Women Futurists?” posted in the Atlantic technology blog, which we discussed in the last issue of Foresight Signals, at least one trend-watching group did something about it. References: Rose Eveleth, “Why Aren’t There More Women Futurists?” Atlantic.com (posted July 31, 2015). Marshall Kirkpatrick, “5 Top Women Futurists & The End of Business as Usual,” GetLittleBird.com (posted August 19, 2015). Cornelia Daheim (Cologne, Germany), is the founder of Future Impacts Consulting and chair of The Millennium Project’s German Node. She was a managing partner with Z_punkt: The Foresight Company for four years, where she was most recently the head of international projects. Wendy McGuinness (Wellington, New Zealand) is founder and CEO of the McGuinness Institute (previously the Sustainable Future Institute), which focuses on the long-term future of New Zealand. She is also a Fellow Chartered Accountant, specializing in risk management. Carol Rieg (Washington, D.C.) is the corporate foundation officer for Bentley Systems Inc., where she established a global employee-giving program reaching 3,300 employees in 45 countries, among other accomplishments. She is also a former national director of the Future City Competition. Learn more about AAI Foresight and its partner consultants. To connect, please contact Tim Mack at tcmack333@gmail.com or call 202-431-1652. Thank you to all who responded to Foresight Signals’ reader survey in our last issue. Based on an overwhelming (63.6 percent) preference for “all of the above,” we will continue to offer short stories on trends and forecasts as well as news about foresight professionals and projects. To this mix, we will also add longer, “deep dives” into significant issues and interviews or profiles of futurists and other forward-looking individuals and groups. Feedback is always welcome! Log in at the AAI Foresight website to post your comments or drop a line to Tim or Cindy.